Login to simply configure your equipment in a few clicks! The headroom is the main asset of the PFI. 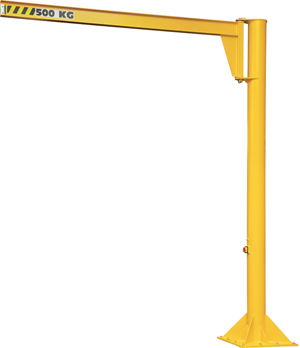 Its I beam profile allows to consider installation of a hoist with electric or manual steering. Floor fixing is effected by chemical anchors or anchor rods with foundation. A full range of accessories is available. Installation template + anchor rods (or base plate for chemical anchors, keeping its limitations in mind). Rotation slowing device (adaptable without welding or mechanical intervention). Hot dip galvanizing (contact us). Rotation stops to weld onto the assembly, or adjustable. Single or multipositions rotation lock.